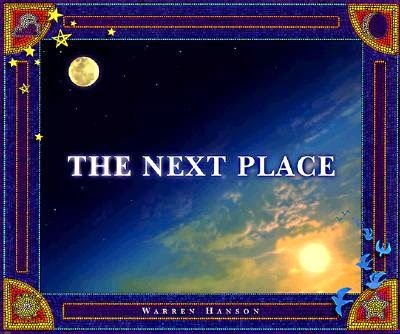 Notes: The title of this little e-book might seem dangerous to some modern readers, but there is little to be worried about as this one pertains to World War II. Originally published in 1944, this is a basic text for friendly civilians trapped behind enemy lines and how they can continue with the war effort in ways to help the Allied Forces. I don't know for sure, but my guess would be this little book was passed out in countries facing being overrun (such as England feared) and was possibly dropped into or somehow distributed in countries already occupied by Axis powers. 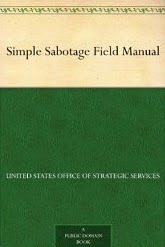 And for those who don't know, the Office of Strategic Services, aka the OSS, were the precursors to today's CIA. Mini review: The mischevious teenage version of me would have had a field day with this book. There's lots of information about slouching off on the job, of how to disrupt motors of all sorts, and of how to subvert authority while appearing subserviant. As is, it's an interesting piece, and I got the impression from a few remarks it was planned to be released right before D-Day in order to give the Allied troops just a little bit of extra help behind enemy lines. Notes: This book was sent to me by the nursing home where my father passed away. Mini review: Quite the short book, mainly a poem with plenty of interesting artwork, the author being the writer and artist. It was a nice little book, more for children I felt, but it did bring a tear to my eye. It's not exactly a book about grief, but one which could help those dealing with grief after losing a loved one. From a Christian point of view. To repeat, I thought it especially appropriate for children. 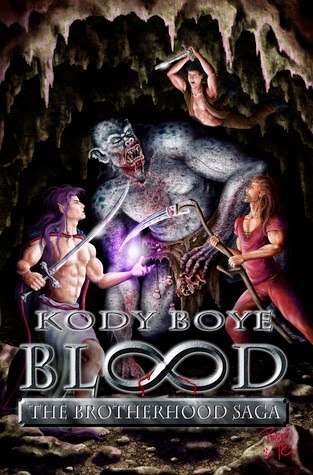 Notes: BV Larson has been a prolific and popular independent author/publisher for going on five years now, being one of the early risers among the fantasy and science fiction genres. A few years back I interviewed him and I made an appearance on his site, but until now I'd not given myself the opportunity to check out his work and see why he has thrived as an indie. Mini review: More adventurous fairy tale than true epic fantasy, I thought this one started off pretty good, but then it seemed to bog down and remain slow almost until the end. It wasn't that things weren't happening, just that there seemed little sense of urgency. But that's just my opinion. Notes: I read the first novel in this fantasy series, Wizard's First Rule, about a decade or so back, and while I found the writing strong enough and several interesting aspects to the author's world, I was kind of turned off when some of his philosophizing became a little too apparent within the story. It's not that I object to objectivism itself, though I do believe it has problems almost always glossed over by its proponents, but that I didn't appreciate such being forced into my face, so to speak. Well, time has passed, and I thought I'd give this writer another chance, especially as I do seem to recall his particular writing style being pretty strong. I guess I'll find out whether my memory is correct. Mini review: This novel started right off where the first one ended, and because it had been so long since I had read that first novel, it took me a while to recall names and events. Still, despite the jarring sensation early on, soon enough I was back into the flow of things. This book confounds me. There are aspects of it I truly liked, but there were also plenty of things for which I did not care. Most of the characters came off a little flat to me, for instance, and some events seemed to drag on for far too long while others, seemingly important ones, were glossed over or even outright omitted though explained later by characters. Also, and this not the author's fault, this was one of the absolute worst proofed e-books I have ever read, with constant spelling mistakes every few lines; I'm generally willing to give an indie author a lot of slack, but this was a long novel from a major publisher and a pretty major author. As for things I liked about this book ... well, it's a little difficult to describe, but when all fires were burning, the reading was quite enjoyable, the story flowed well and the characters were at their best. I noticed the most fun parts of this novel, at least for me, were when the characters were faced with seemingly insurmountable odds. 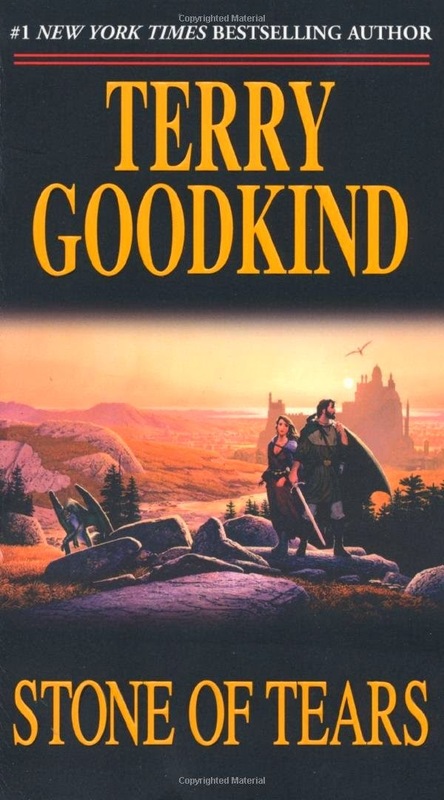 Despite being epic fantasy, this is mostly written in a modern voice with character names common to the real world, but that didn't bother me though I realize it might others. It's been years since I did a weapons post, and considering I recently inherited a number of firearms from my late father, I thought it time to write a little about weapons again. For those not familiar with me, no, I have no military or law enforcement background; I'm merely a civilian who enjoys studying weapons of all sorts, and I'm a fiction writer who wants to make sure I know what I'm writing about when it comes to weaponry, and this comes through first-hand knowledge. The subject of this post is a 5-shot revolver in .38 special from Brazilian firearms company Taurus. Right off I'll admit I'm normally not a big fan of .38 weapons, though I love the .38 round. Does this seem strange to you? It makes perfect sense to me. See, my personal favorite round is the .357 magnum, and I dutifully enjoy firearms which launch .357 magnum rounds. One of the great things about .357 magnum weapons is that they can also fire off .38 special rounds because the two rounds are pretty much the same width, though the magnums are quite a bit longer. So, you can fire .38 rounds from a .357 magnum weapon, but you can't fire .357 rounds from a .38 weapon. Make sense? Basically, .357 rounds are too long to fit into a .38 weapon, but .38 rounds will fit into a .357 magnum. All that being said, this is a pretty nifty .38 special revolver. For one thing, it's got a 3-inch barrel, which is rare in the Taurus Model 85 which normally sports only a 2-inch barrel. Some might say the extra inch doesn't matter a lot, and maybe it doesn't since this is basically a short-range firearm, but it matters to me for not only aesthetic reasons, but because I prefer the extra heft and weight of the longer barrel. It comes in double action with single action an option when you pull back the hammer, features which are common in many modern revolvers and which please me from a sheer familiarity factor. This revolver comes in a small frame, but it still has a good feel in my large hands, reminding me somewhat of the look and feel of the larger Smith and Wesson revolvers, specifically the 586 and 686, some of my favorites. There is a downside with this small frame, however. 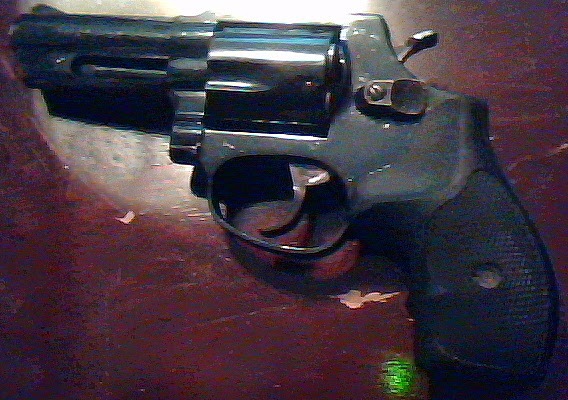 That downside is this revolver actually kicks quite a bit, or at least more than I would like it to with .38 rounds. I'm more used to firing .38s from heavier .357 magnum revolvers and rifles which leave little to no kicking with the .38s, but here I'm having to adjust to a rising barrel and a bit of jump in my hands; none of this is specifically the fault of the firearm, but just my lack of familiarity with .38 specials. The small frame also makes this a pretty good gun for concealed carry, though I have no plans to do so, at least not with this weapon. Another thing with which I'm unfamiliar when it comes to this firearm is the fact it only holds five founds in the cylinder. I'm a six-shooter man. Always have been. Every revolver I've ever owned until this one has held six rounds. Yes, I'm fully aware there are revolvers of various calibers which hold seven or eight or nine or 10 or more rounds, but I've never been tempted by them. They're called a six-shooter for a reason, is my way of thinking, so I've always stuck with the six. Not that only having five rounds is some heavy burden, but it'll take some getting used to. 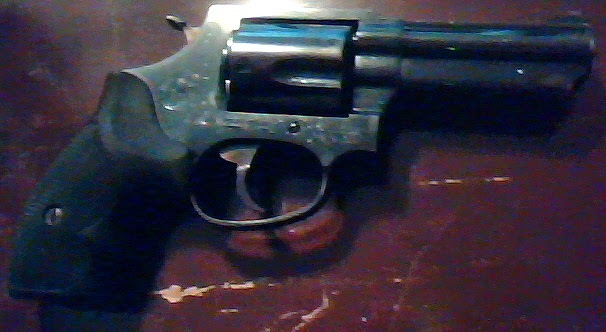 All in all, this is a small revolver I can carry around when outside in the woods around my place, and I can do some target practice with it from time to time, but I won't be using it for carry and it wouldn't be my first choice when it comes to home defense. It's a nice little gun with no major faults of its own, and it feels as if it is made with quality, so I have no complaints there. Notes: All this year I've been promising myself I would read more fantasy, specifically epic and heroic fantasy along with more Sword and Sorcery. Well, for one reason or another I've not been doing that. No more time for excuses. It's time to get to some fantasy. And what better way than by trying out an author new to me? Just look at that cover. Doesn't it just scream early Dungeons & Dragons? I think so, and in a good way. So I'm hoping to enjoy myself here. Mini review: A lot of writers, and perhaps some readers, would have plenty of complaints about this book. After all, it does contain many of the hallmarks of a young, inexperienced writer. But me, it didn't bother. I actually found it quite enjoyable. It was interesting to watch the writer's growing experience as the story continued, and I have to admit I like the characters quite a bit. And while the fantasy world didn't come off as unique, being filled with orcs and elves and dwarves, etc., it did have some minor differences that gave it a touch of its own flair. There was not as much action as I expected, but there was a bonding process between the trio of major characters which I found not common enough in most fantasy heroes; these men were more than brothers in arms, more than brothers, almost practically lovers in their regard and feelings for one another. This is a strong story about friendships. 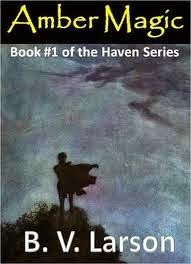 It is told from a youthful voice, reminding me more of the likes of Paolini than someone like Martin or Salvatore. Maybe it's because my dad died while I was reading this one, but I liked a lot of what it had to say about male companionship, and it does so by showing three men who are as close as close can be. With that in mind, this isn't an overly masculine story. You're not going to find lots of chest thumping or bravado here. In a way, it's almost a romance, a love story of three men, a squire, a knight master, and their guardian. While it is not a perfect work of literature, I appreciate what the author was doing with this story. At some point I will have to seek out the followup tales. And this book is another example of why I try out new indie authors, because otherwise I likely would have never experienced such a work. I don't want to get all maudlin here, but the subject matter can be quite depressing, so if you're in the mood for something sunshiny, you might want to look elsewhere today. Just a warning. Anyway, I've had a lot of people voice their sympathy for me over the last month since my wife died on May 11. I've also had a number of people voice sympathy over the fact my father has also been diagnosed with Stage IV cancer (of the lungs, liver and stomach) and he is entering hospice care within the next day or two. Most people don't ask for details, but some few do. I'm not going to go into morbid, specific details. I'm not here to tell you how my wife died, though I believe it was peaceful enough, and I could easily recite the events of every single minute of the last two days of her life. I'm not going to go into details about my dad's suffering. What I am going to do is provide a few snippets of my thoughts over the last month. For instance, I had heard of widows and widowers speaking about the anger they felt towards their deceased spouse, and I never understood it. It seemed unfair and even a little silly to me. But now I understand. I've not been overwhelmed with such anger, but I have felt it a few times, especially when I found out about my dad's cancer. A rage boiled up inside of me, and I was angry at my wife for not being there with me to help me get through what I was going to have to face with my father. Also, during all this, our beagle Lily had a tumor rupture and she had to have surgery, and even though she has mostly recovered and is doing fine, I was a little angry at my wife for not being there for her baby. See, Lily is a daddy's girl. Ever since I began staying home to write full-time, about four years ago give or take, Lily has stayed with me almost constantly. I can't leave a room without her following me, and if I go outside without her she will stay by the back door and sniff and sometimes cry. Until she gets sick, or has surgery. When Lily does not feel good, she wants her mommy. She has always run to her mommy when she has had an upset stomach or ... well, anything, really. But mommy is no longer here, at least not physically (as for other possibilities, I'm not here to debate them). And of late, after Lily's surgery and without her mommy, poor Lily has been doing a lot of pouting. She spent an hour or longer with her head under the wife's side of the bed, just laying there. A hundred times she has searched the bedroom, gone back to my wife's bathroom, climbed up on the bed, looked all over. Onto other thoughts and situations. I find myself still using the word "we" a lot. I catch myself and often repeat myself with the word "I." For example, I can no longer tell someone "we" are proud of our beagle girl, who turned 15 years old on June 3. No. I now have to correct myself, repeat myself, and say "I" am proud of my beagle girl, who turned 15 on June 3. Grocery shopping is weird. I now only shop for one, and despite the fact it might sound fun, I don't particularly like it that I can now buy whatever I want. Because I'll buy crap. Also, I no longer have to make three or four calls to the house to ask for specifics, or to report about some new item that looks interesting. I also no longer can expect the usual call or two to remind me about something. Her stuff ... it is everywhere, and all of it has some memory. I can't go into the bedroom or the kitchen or ... well, really, I can't go into any room in the house without my eyes landing upon something that has some kind of meaning or memory or something reminding me of the wife. And I still have all her stuff to go through, to throw away or donate, to sell or give to friends and relatives, or to keep. I've simply not had the time, what with dealing with my dad's situation and the beagle's surgery. I don't want it all to sound awful. There have been times when I've felt relatively good, when I've felt that at least she is beyond the pain, and maybe, hopefully she and I might see one another again someday. But then there have been the long nights where I sort of putter around the house in a daze, going from room to room, looking from item to item, picture to picture, occasionally putting something in a bag or box to be shipped off or taken for donation. And of course there are the moments where all I want to do is break down and cry. Sometimes I do. I would like to say such moments are fewer and fewer, but ... well, it's been weird. I didn't cry much at first. Then about a week after her death, I had several days with a lot of crying. Then things seemed to get better for me for a while. But of late, there's been lots more tears. My days are relatively easy. There is plenty during the days to keep me busy, at least most days. My nights are often filled with tragedy, and weekends are rough. There have been moments where I've not feared death, where I would almost welcome it, because I feel like I would get to see her again. Please, don't take this as me being dramatic or dangerous to myself, because that's not the case at all. I have no intentions of harming myself. None. I also have no intentions of climbing into a bottle. That has a certain appeal to it, but I think if I did that, I'd probably never come back out. And I do have Lily to think of, and my dad is still around for some while, and there's my mother (who had better stay healthy for a good long while, damn it). I could say more, lots more, but this is depressing enough, really. Isn't it? Besides, as is often the case, I'm writing more for myself than I am for you, the reader. I hope in this instance you will forgive my indulgence. Speaking of my writing, I actually have done a little. Not a lot, but a little. It's total crap. I know that. But that's not the point. The point is to keep doing something. I have to work, after all, because there are still bills to be paid. Maybe I can edit and rewrite at some future date, or maybe I can scrap it all and start over, but at least I'm writing. That's all for now. Just ... hug your loved ones, and never take them for granted. P.S. I'd like to add one last ... sensation. Even though Kelly, my wife, and I were only together 12 years, it felt as if we had known one another all our lives, as if the time before we had met had only been a waiting period until we found one another. Now, it feels strange without that sensation. It's like I'm starting my life all over again, having to restructure my thinking, having to recreate myself. Will that affect my writing? I don't see how it can't. But how? That is yet to be seen.